Enugu —The emergence of female members of the Indigenous People of Biafra, IPOB, who disrupted last Thursday’s meeting of Southern and Middle Belt leaders in Enugu has brought a new dimension to the separatist agitation by thousands of Igbo youths who feel frustrated about the way their country is being run. The Director- General of South East Governors’ Forum, Professor Uchenna Ortuanya, who reacted to the emergence of the Biafran women, described the situation as a serious security issue and wondered how security agencies would deal with such a matter. Apart from causing confusion at the Thursday meeting tagged Handshake Across The Niger: A celebration of Igbo/Yoruba Friendship Beyond Brotherhood, the women who invaded the Base Events Centre, venue of the meeting at Independence Layout under the guise of Umuada Ndigbo (daughters of Igbo) also stripped naked outside the hall as they protested their inability to re-enter the center after leading the representative of the Ekiti State Governor, Ayo Fayose and former Minister of Aviation, Chief Femi Fani- Kayode out to ease himself. As Fani- Kayode moved out, the IPOB women sang solidarity songs like: Fayose nidi anyi mma, ngbongbo; onye Chukwu nyere eze, na madu apughi ina ya, ngbongbo… (Fayose, we like you, the one who God has crowned, no human can take away his crown) as they moved en-masse behind him. However, their moving out created an opportunity for security operatives as they were not allowed to re-enter the hall. One of them who identified herself as Madam Chichi said, “I am 47 years old. How will soldiers kill our unarmed children who were merely agitating for a referendum while those who carry AK-47 rifles, kill and maim Nigerians across the country are hailed by the Federal Government? “We are tired of being in this country. They should allow us to go to Biafra. Nigeria’s unity is negotiable. We do not want the injustices and oppression going on in Nigeria….,” she said, lamenting that Nwodo and other Ohanaeze Ndigbo leaders had sold out by supporting the agitation for restructuring of the country. Before they moved out, the women appeared to have mobilised themselves to embarrass Chief Nwodo and other speakers, for supporting the agitation for restructuring instead of supporting each of the regions to go their separate ways. They began to interrupt Nwodo and Ayo Adebanjo who led the Afenifere delegation to the occasion as they made their speeches. Nwodo had pointed out the need for the Southern part of the country to work together with the Middle Belt as well as the need for restructuring of the country to create a level playing ground for all Nigerians when the Biafran amazons began to raise their voices which drowned Nwodo’s speech. The President-General had said that the Fulani herdsmen were daring Nigerian unity, wondering why the Federal Government had refused to declare the herdsmen a terrorist group. He observed that students of secondary schools and universities were invited to the meeting because, the upcoming generation needed to be carried along in what was going on in the country, noting that the wrong narratives about alleged poor relationship between the Igbo, Yoruba or any other tribe, needed to change for good. According to Nwodo, properties or houses of Ndigbo were not seized in Yoruba land after the Nigerian- Biafran civil war, as was the case in both the North and other places where there was the abandoned property syndrome. He, however, invited the Yoruba to build houses as well as establish their businesses in Igbo land as Ndigbo also, owned sizeable property in Lagos and other parts of Yoruba land. He stated that the quest for restructuring was no longer negotiable and urged the Federal Government to yield to the popular demand of the peoples of Nigeria by restructuring the country along regional lines. The noise continued as Chief Ayo Adebanjo, among others, spoke until the former Aviation Minister, Chief Femi Fani-Kayode, began his speech, by giving reasons why he stood by the IPOB leader, Nnamdi Kanu during his travails. The mention of Nnamdi Kanu, who had been missing since October 13, last year, when soldiers under the Operation Python Dance invaded his family house at Umuahia, Abia State, electrified the hall, as the crowd began to sing solidarity songs in support of Kanu, Fani- Kayode and Fayose to the consternation of security agencies in the hall. Fani-Kayode called for the declaration of the Myitte Allah as a terrorist organisation adding that Buhari’s government had an agenda to cripple enterprising Igbo businessmen like Chief Innocent Chukwuma, Dr. Ifeanyi Ubah and Chief Cletus Ibeto. He said the period of reckoning had come as the people have come together to say no to being slaves to a handful few in Nigeria. “I call for the proscription and banning of Myitte Allah and the Fulani herdsmen. I call on the Federal Government to ban then, declare them as terrorist organisation and I should be reported,” he said. He also recalled that the founders of Nigeria including Chief Obafemi Awolowo, Dr Nnamdi Azikiwe and Chief Dennis Osadebe realised the need for a balanced federation by not only recommending but ensuring true federalism during their time. Adebanjo wondered why Buhari could claim to be more northern than Sardauna of Sokoto, Sir Ahmadu Bello among others . Former Governor of Ondo State, Olusegun Mimmiko said the Handshake initiative could lead to advancement of Nigeria, noting that every genocide in history emanated from evil perception of racial/ethnic superiority/insecurity, whereas the greatest nation of modern times was built on an idea of equality. Mimiko stated that Nigerians in their quest for rapid development must eschew ethnic prejudices and build politics around positive ideas. The Chairman of the Middle Belt Forum, Chief Timothy Gwambe said that the Hausa/Fulani tribes dominating the North-West and the North-East constituted 33 million of the population going by the 2006 population census, while the other four geopolitical zones including the South-South, South-West, South-East and the Middle-Belt were over 99 million people. Gwambe who hails from Southern Kaduna therefore wondered how the minority will be using force and the security apparatus to lord it on the significant majority with all their attendant education, industry and dynamism. He spoke as the former governor of Plateau State, Jona Jang saw the handshake across the Niger as rebirth for the country. “We must ensure that true federalism which our fathers handed down to us prevails,” Jang said while regretting that the military which he was part of, foisted the 1999 Constitution on Nigerians. Others who spoke in the same vein included Prof. Anya O. Anya, Prof. Pat Utomi, Dr Patrick Ifeanyi Ubah, and Sen. Enyinnaya Abaribe, who represented the Deputy Senate President, Ike Ekweremadu and Sen. Mao Ohuabunwa among several others. The Ooni of Ife, Oba Adeyeye Enitan Ogunwusi was represented on the occasion, attended by several traditional rulers including the Obi of Onitsha, Igwe Alfred Nnaemeka Achebe. However, the meeting continued uninterrupted from the time the Biafran ladies departed until the end. Ms Onyeka Onwenu sang the unification music of One love, which leaders like Olu Falae, Ayo Adebanjo, Dr Olusegun Mimiko, Yinka Odumakin, Jonah Jang, Dr Chukwuemeke Ezeife, Ikedi Ohakim, Prof. Banji Akintoye, the families of both Aguiyi Ironsi and Col. Adekunle Fajuyi among others, danced to. After the music from Ms Onyeka Onwenu, an opportunity came for the security agencies to clear the women from the hall when Chief Fani-Kayode stepped outside briefly and they moved out en-masse, singing Fayose’s praises. 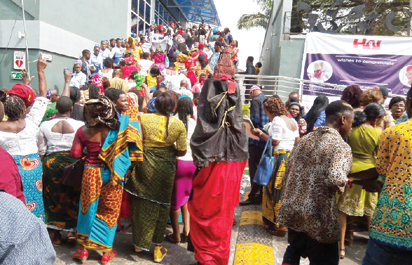 The post Handshake across the Niger: How Biafran women stripped naked, protesting against restructuring of Nigeria appeared first on Vanguard News.